Today, we're all mobile and connected as part of an ongoing urban revolution. Mobility affects the way we eat, work, consume and think. Digital lets us do anything, when we want and where we want. We are moving from an era where each place had its own specific purpose and identity to an era where times, places and identities are all mingled together. With digital, any place becomes multi-functional and this has an impact for everybody. Existing places are not disappearing but they will be forced to transform, to mutate and to change their nature. What is an office when 30% of Europe's working population spends more than one-quarter of their time away from what is commonly referred to as their workstation? 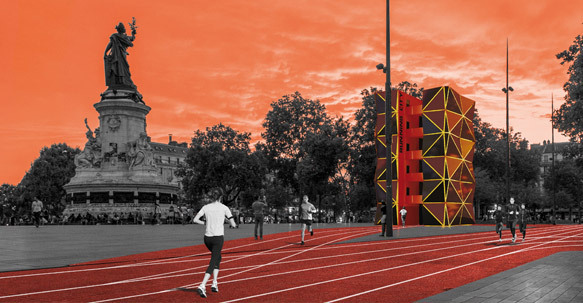 Based on mobility and permanent connectivity, this new urban condition will demand new responses and, more particularly, new places to host these nomadic practices. Everybody is using new stopover and transit points, sometimes referred to as third places. These transit points have imperceptibly become part of modern behaviour. At the same time, they have had to change. No longer dedicated solely to transport, they have become places for services, work, rest and shopping. From transitional areas, they have become living spaces that are increasingly multi-functional. This process encompasses each and every location. Car parks, for example, are becoming drive-through hypermarkets. To study the changing face of these transit points used every day by millions of people around the world, Algeco® is launching a new edition of its competition. The subject is: "Transit 2025: what will transit points look like in 10 years’ time?" The objective of this competition is to think about how modular constructions could further the process of change, looking ahead to 2025, in order to better address the increasingly rapid pace of change in lifestyles, consumer habits, working practices and entertainment.